Joel loved the feel and the roll, along with the grip. All testers noticed the head is very short from front to back and has the unique, brassy two-tone finish. James liked the smooth, flare neck making up the hosel and noted the loud sound he got off the face, even on short putts. Joel loved the feel and the roll, along with the grip. Dave loved the skinny shape and clean lines, but not the colour because it wasn’t uniform. He managed to strike them consistently. 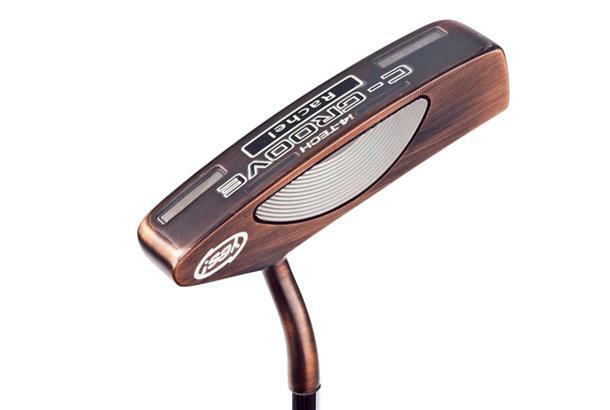 The i4-TECH Rachel is a heel-shafted, blade-style putter with a smooth flare-neck hosel. Featuring advanced i4-TECH C-GROOVE technology this blade will roll as pure as it looks. It also creates a soft-responsive feel. Rachel also has Tungsten weighting for maximized MOI stability.